hi all. hope someone can help, I remember seeing a article on how to get a neon setup lamp for spectroscope from a fluorescent starter. Thanks Robin that is exactly the one I needed. 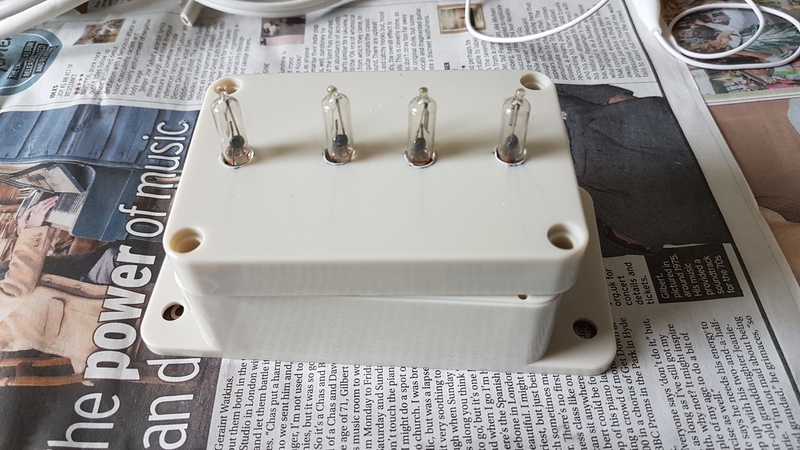 I have started to make my RELCO starter based calibration light - my first version is driven by 240V through inverter in field, although I would like to have a go at making the disposable camera circuitary based version in the future. 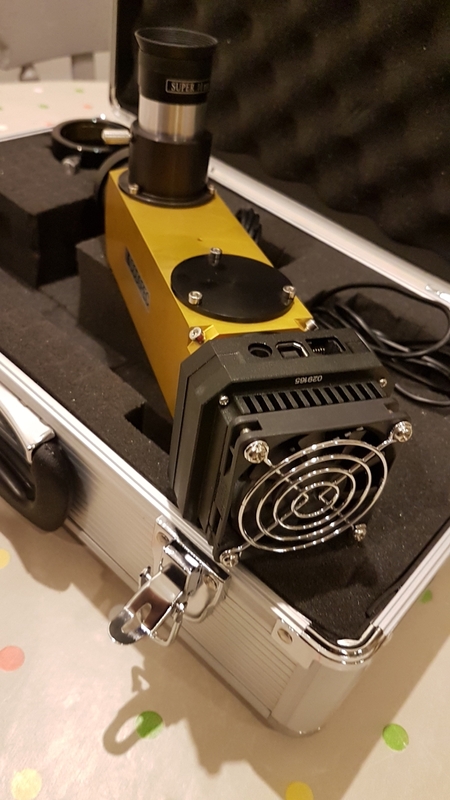 At our Astro club, earlier in the year one of our members (Ed) made some fantastic leisure battery based battery packs for us and hence we have access to ready supply of low amp 250V in field. Next step is to house it all in something safe to stop getting electrocuted when used outside! I also intend to use a circuit breaker in line with the plug. NB I am not a qualified electrician so if anyone follows in my footsteps please ensure you are qualified to do the job or ask someone who is to do it for you. Many of us are making use of the RELCO bulbs as reference lamps. I have a set-up which makes use of a 12v to 220v PCB built into the spectrograph. This restricts the higher voltage to the enclosed housing. Very safe, very effective. I have used external boxes and sealed everything with a glue gun and will also add in RCD in the field. 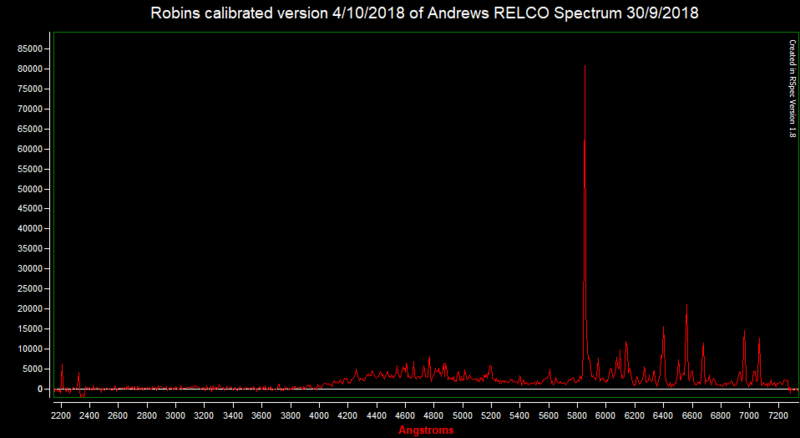 My first calibration spectrum using my new RELCO starter neon/argon light source - this is from Science Surplus DIY Spectrometer. As this Spectrometer is set up, it is missing most of red end spectrum. 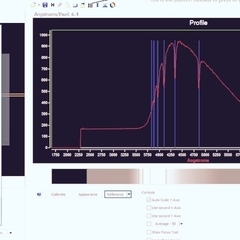 What you have is a reference profile...when you can identify the various neon/ argon lines and allocate a wavelength to each, you can then use this info to calibrate in wavelength (nm or A) and determine a valid A/pixel relationship. 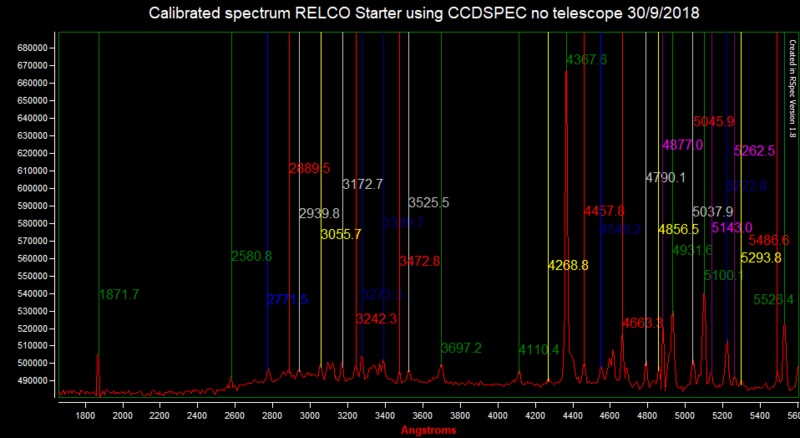 The following links to the start of my first attempt at calibrating above RELCO starter spectrum against solar spectrum. The solar spectrum is tough to use at this resolution because all lines you are trying to measure are blends of many lines so you don't know their precise wavelength. If you are interested in an astronomical calibration source then hot, A type stars are good as they have strong unblended H Balmer lines. If you produce say a 2nd order fit using these, your calibration should be close enough to identify the RELCO lines. At this resolution you still need to chose the RELCO lines with care though, watching out for blends. Once you have a good set of reliable lines you can use these to calibrate all your spectra. Thanks folks for your comments - really appreciated! Just goes to show how difficult it to identify the lines on the spectra......any ideas on the best way to do that? I am coming around to the idea that the compact fluorescent bulb is the easiest to use method for low resolution spectroscopy - readily identifiable lines and in my experiments they are highly reproduceable between bulbs. I am still hoping to sort out the use of the RELCO bulbs though, as I have put a lot of effort into them and they are a neat solution to the problem of calibration in the field. 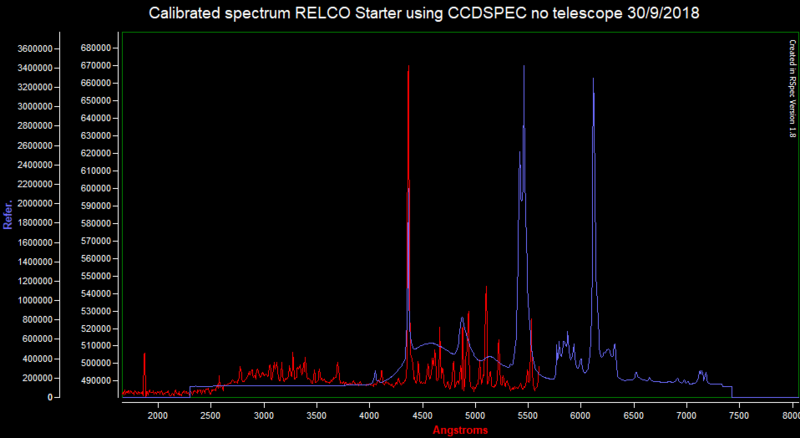 In order to take the spectra today, I double bagged the RELCO/CCDSPEC - so hopefully, I will have avoided the ghost/contamination spectra Robin noted above. 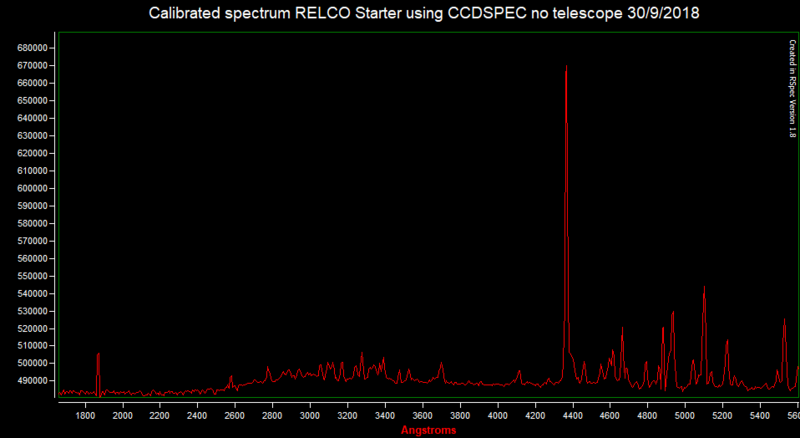 Thanks for posting your RELCO spectrum - below I have graphed it in RSPEC - is there any chance you could post a calibrated version (so that I can extract wavelengths of the peaks) + DAT file so I can load it in RSPEC and get accurate wavelength data? 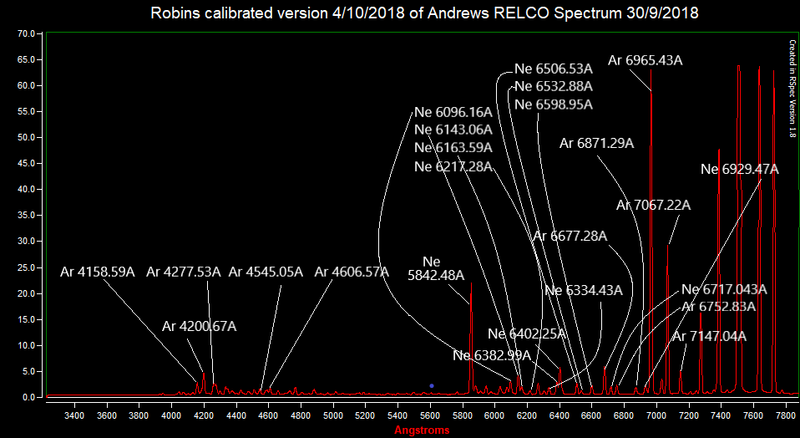 I have just had a look at the 200 lines/mm chart in the atlas at www.ursusmajor.ch/downloads/sques-relco-sc480-calibration-lines-5.0.pdf and sadly I can't see any obvious match on the lines with my chart - ahhhh! Help please! In image below I have tried to match your spectrum to mine. It is not obvious to me where I should stretch the image/i.e. a second data point compared to your data - can you help? 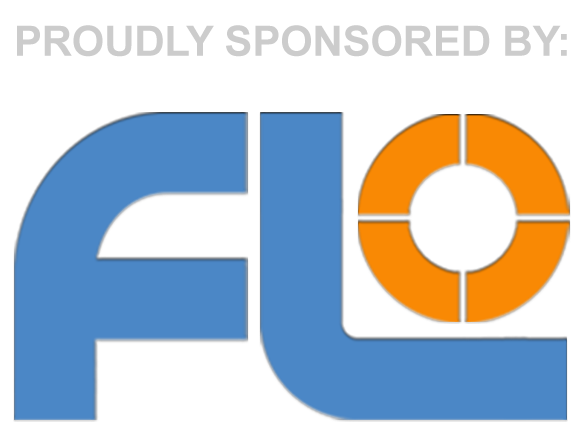 I have enclosed my combined image + data as ZIP file. 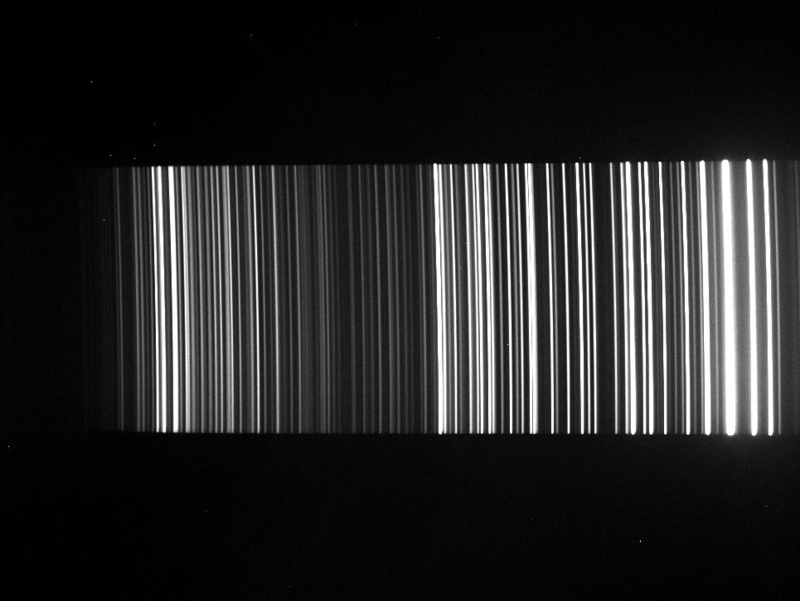 Here is a rough 2nd order calibration of your 30 sec RELCO exposure, using 3 lines, overlaid on my ALPY spectrum. You can see the good agreement, though I noticed your lamp spectrum is much noisier with a high background compared with my 10 sec ALPY spectrum. (Note the extra line in your spectrum at 6563A. This is Hydrogen Alpha. It has leaked through the glass in my older lamp). The sensitivity in your spectrum drops off at the UV and IR ends compared with the ALPY spectrum. Are you using a UV/IR cut filter by any chance ? Also attached is the dat file of your roughly calibrated spectrum. 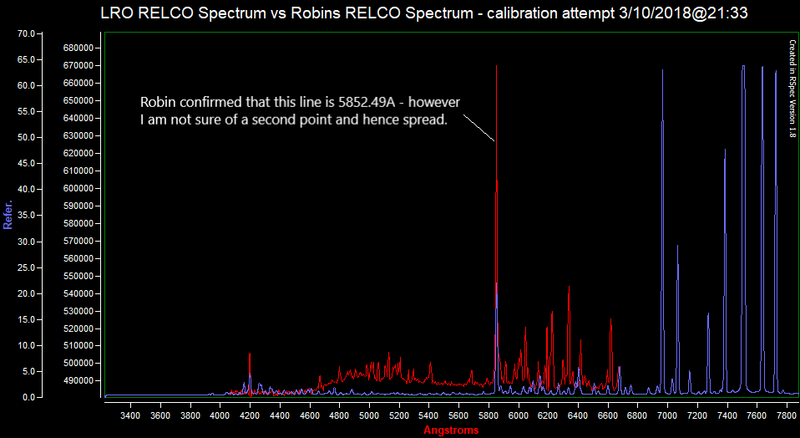 Thanks very much Robin - for future reference I have loaded up your calibrated version of my RELCO spectrum here. The spectrum here was taken using CCDSPEC spectrometer - I attempted to exclude extraneous light by wrapping both CCDSPEC and RELCO light in 2 layers but some light probably got in so spectrum won't be perfect. 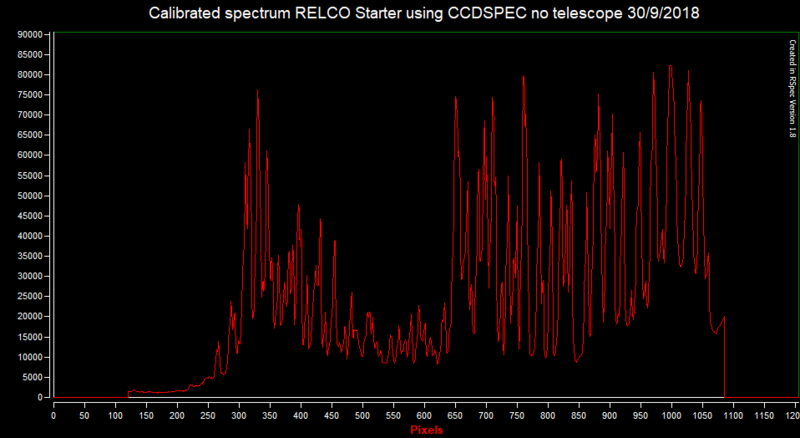 This is spectrum using RELCO and CCDSPEC - not using a telescope. Robin used following lines for calibration, and commented that it would be better to add a few more lines, making sure they are well spaced and cover the full spectrum (particularly the blue end, but they were rather indistinct in your spectrum) and do a 3rd order fit. The dispersion is approximately 6.5A/pixel , though this varies along the spectrum of course as it is non linear. Once I am happy with the identifications, I will tidy up the diagram! Robin - do you think I have correctly identified the lines? Also included below are pictures of the CCDSPEC Spectrometer and my homemade RELCO starter calibration light and a dismantled RELCO Starter Unit showing the bulb as it comes out of the starter. I would try to extend your coverage at the blue end a bit further if possible. Your spectrograph should be able to cover down to at least 3800A. As I mentioned though it looks like something is limiting your sensitivity at the blue and red ends. Are you using a UV/IR block filter somewhere, either on the camera or built into the spectrograph?